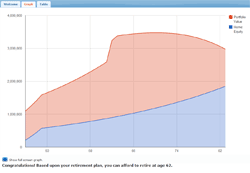 Welcome to FourPercentRule.com Retirement Calculator. What makes our calculator different? 1. Ease of Use:	The easy slider controls and instant graph updates makes it very easy to experiment with lots of different settings. 2. 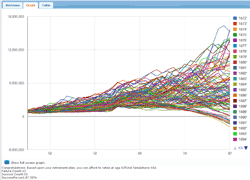 You can simulate retirment scenarios using both estimated or historical returns. Think you'll receive social security? Do you have a pension? Do you expeect to receive an inheritance? Will you leave one for your children? 4. You can save and share your results! Would you like to include your retirement plan in this list? Sharing your plan is a fun (and anonymous) way to compare your plan with other members. It's interesting and educational to learn how others are planning to retire. How does your net worth compare to other members of the same age? How does your rate of saving compare? To share your plan, simply save your plan and answer "Yes" to the "Include on "Members Plan" tab?" question on the form. Passwords do not yet match. Are you sure you want to delete this plan?